Like most parents, I think my kids are pretty much the most awesome people in the world. My husband is cool too, although it’s less cute when he babbles, drools or gets food all over himself. Anyway, I’m truly thankful for my family, home, job, church and friends. 1.) I taught my son to pick his nose. I actually gave him candy as a reward for picking his nose. In my defense: When I try to clean his nose, he behaves like a wild animal whose last meal is stored up in his nostrils. I’m talking about screaming, crying, kicking, pushing and sometimes growling. And frankly, someone needed to create some vacancies in that crowded space. I mean you can’t just leave them hanging there, so teaching him to do it himself is an accomplishment. 2.) When he did manage to extract something, he looked at it with mild interest, then proceeded to wipe it on the closest thing within reach, which happened to be the back of his dad’s neck. Now, the next thing that happened is that we both started laughing, and if you are at all familiar with young children, you know that when you laugh at something they do, they continue to do it over and over for a very long time (like up to and including middle school.) So yeah, laughing was a serious mistake. But it was also an ingenious way to make sure he keeps picking his nose, so that’s an accomplishment. Right? Oh. No? Hmm. 3.) I have always wanted to be one of those people who can just fall asleep anywhere, like in the middle of the floor with a doughnut in my hand. Yes. That black thing beside Lamby’s head is a doughnut. I have never been able to be one of those people, but I think producing one is the next best thing. So that’s an accomplishment. 5.) I continued to geek-out about my schedule and bought a new (and awesome) type of calendar (watch the video with me and wonder why this has never been patented before). I have high hopes that with the utilization of this calendar, I will streamline my life in such a way that I will manage to schedule more than two showers a week. In fact, I am hoping that the new and improved organized and better smelling me will not even need to include basic hygiene on her calendar at all. That is going to be a BIG accomplishment. 7.) 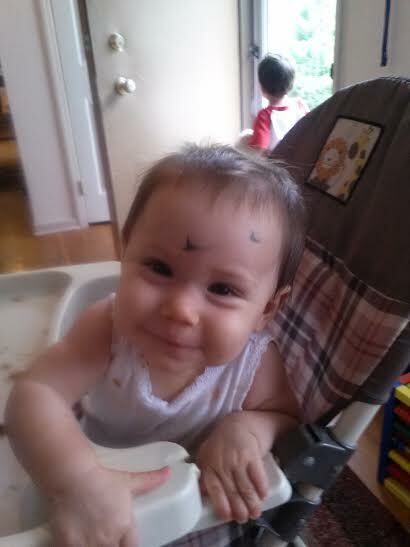 Sometimes when my son is coloring with markers, and there’s no paper within easy reach, I let him use the baby’s face. KIDDING. Who do you people think I am? But yeah, there’s really just no way to look at this one as an accomplishment. That’s just embarrassing.